Hopewell, D & Edwards, N 2017, 'Early Medieval Settlement and Field Systems at Rhuddgaer, Anglesey', Archaeologia Cambrensis, vol. 166. Edwards, N 2017, 'Early Medieval Wales: material evidence and identity', Studia Celtica, vol. 51. Edwards, N, Flechner, R & Mhaonaigh, MN (eds) 2017, Transforming Landscapes of Belief in the Early Medieval Insular World and Beyond: Converting the Isles II. Cultural Encounters in Late Antiquity and the Middle Ages, Brepols Publishers. Edwards, N 2017, Christianising the landscape in early medieval Wales: the island of Anglesey. in TO Carragáin & S Turner (eds), Making Christian Landscapes : Conversion and Consolidation in Early Medieval Europe. Cork University Press, pp. 177-203. Edwards, N 2016, 'New discoveries of early medieval carved stones in Wales', Archaeologia Cambrensis, vol. 165, pp. 187-199. Edwards, NM, Edwards, N & Vousden, N 2015, 'A rediscovered piece of early medieval sculpture from Silian, Ceredigion', Archaeology in Wales, vol. 53. Edwards, NM & Edwards, N 2015, The Early Medieval Sculpture of Wales: Text, Pattern and Image. Cambridge University Press. Edwards, N 2014, 'Wales and the Britons 350-1064', Welsh History Review, vol. 27, no. 2, pp. 368-370. Edwards, NM, Gould, J, Evans, N (ed.) & Pryce, H (ed.) 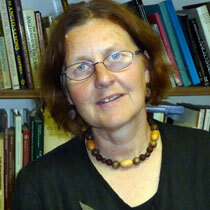 2013, From antiquarians to archaeologists in nineteenth-century Wales: The question of prehistory. in Writing a Small Nation's Past: Wales in Comparative Perspective: 1850–1950. 2013 edn, Ashgate, pp. 143-164. Edwards, N 2013, A Corpus of Early Medieval Inscribed Stones and Stone Sculptures in Wales: Volume 3 North Wales. vol. 3, 2013 edn, University of Wales Press. The Pillar of Eliseg, Llantysilio. Incomplete inscribed cross and cairn. Edwards, NM, Edwards, N, Robinson, G, Williams, H & Evans, DM 2011, 'The Pillar of Eliseg, Llantysilio. Incomplete inscribed cross and cairn. ', Archaeology in Wales, vol. 50, pp. 57-59. Edwards, N 2011, Viking-age sculpture in north-west Wales: welath, power, patronage and the Christian landscape. in F Edmonds & P Russell (eds), Tome: Studies in Medieval Celtic history and Law in honour of Thomas Charles-Edwards. 2011 edn, Boydell, pp. 73-87. Edwards, N 2010, 'Edward Lhuyd – an archaeologist’s view', Welsh History Review, vol. 25, no. 1, pp. 20-50. Edwards, N (ed.) 2009, The Archaeology of the Early Medieval Celtic Churches. Society for Medieval Archaeology Monotraphs, vol. 29, 2009 edn, Routledge. The archaeology of the early medieval celtic churches – an introduction. Edwards, N 2009, The archaeology of the early medieval celtic churches – an introduction. in The Archaeology of the Early Medieval Celtic Churches. 2009 edn, Routledge, pp. 1-18. Categorizing Roundhouse Settlements in Wales: A Critical Perspective. Edwards, NM, Ghey, E, Edwards, N & Johnston, R 2008, 'Categorizing Roundhouse Settlements in Wales: A Critical Perspective. ', Studia Celtica, vol. 42, no. 1, pp. 1-25. Edwards, NM, Ghey, E, Edwards, N, Johnston, R & Pope, R 2007, 'Characterizing the Welsh Roundhouse: chronology, inhabitation and landscape', Internet Archaeology, vol. 23. A Corpus of Early Medieval Inscribed Stones and Stone Sculpture in Wales. Vol 2. Edwards, NM & Edwards, N 2007, A Corpus of Early Medieval Inscribed Stones and Stone Sculpture in Wales. Vol 2. University of Wales Board of Celtic Studies Monograph for University of Wales Press, Cardiff. The early medieval inscribed stones and stone sculpture in south-west Wales: the Irish Sea connection. Edwards, NM, Edwards, N & Moss, R (ed.) 2007, The early medieval inscribed stones and stone sculpture in south-west Wales: the Irish Sea connection. in Making and Meaning. Proceedings of the 5th International Insular Art Conference: Trinity College Dublin 2005.. 2007 edn, Four Courts Press, pp. 184-197. Edwards, NM, Edwards, N & Koch, JT (ed.) 2006, Celtic Crosses. in Celtic Culture: A Historical Encyclopedia. 2006 edn, ABC-CLIO Ltd.
Edwards, NM & Hall, MA 2006, 'Protecting carved stones in Scotland and Wales', Church Archaeology, vol. 7-9, pp. 127-129. The early medieval sculpture of Bangor Fawr yn Arfon. Edwards, N 2006, The early medieval sculpture of Bangor Fawr yn Arfon. in M Meck (ed. ), The Modern Traveller to Our Past: Papers in Honour of Ann Hamlin. 2006 edn, DPK, pp. 105-111. Early medieval Wales: a framework for archaeological research. Edwards, NM, Edwards, N, Lane, A, Bapty, I & Redknap, M 2005, 'Early medieval Wales: a framework for archaeological research. ', Archaeology in Wales, vol. 45, pp. 33-46. The archaeology of early medieval Ireland, c.400-1169: settlement and economy. Edwards, NM, Edwards, N & O Cróinín, D (ed.) 2005, The archaeology of early medieval Ireland, c.400-1169: settlement and economy. in A New History of Ireland: Volume 1 Prehistoric and Early Ireland.. 2005 edn, Clarendon Press, pp. 235-300. Celtic Saints and early medieval archaeology. Edwards, NM, Edwards, N, Thacker, A (ed.) & Sharpe, R (ed.) 2002, Celtic Saints and early medieval archaeology. in Local Saints and Local Churches in the Early Medieval West. 2002 edn, Oxford University Press, pp. 225-265. Pattern and Purpose in Insular Art. Proceedings of the 4th International Conference on Insular art. Edwards, NM, Redknap, M, Edwards, N, Youngs, S, Lane, A & Knight, J (eds) 2002, Pattern and Purpose in Insular Art. Proceedings of the 4th International Conference on Insular art. 2002 edn, Oxbow Books. Early medieval inscribed stones and stone sculpture in Wales: context and function. Edwards, NM & Edwards, N 2001, 'Early medieval inscribed stones and stone sculpture in Wales: context and function. ', Medieval archaeology, vol. 45, pp. 15-39. Monuments in a landscape, the early medieval sculpture of St David’s. Edwards, NM, Edwards, N, Hamerow, H (ed.) & MacGregor, A (ed.) 2001, Monuments in a landscape, the early medieval sculpture of St David’s. in Image and Power in the Archaeology of Early Medieval Britain: Essays in Honour of Rosemary Camp.. 2001 edn, Oxbow Books, pp. 53-77. Edwards, NM, Jones, N, Silvester, B & Edwards, N 2001, 'St Cyngar’s Church, Hope. ', Archaeology in Wales, vol. 41, pp. 42-50.